Furnished 1 bedroom Downtown Portland extended Stay. Washer.Dryer. Reserve now for spring and summer! Stay minimum 31 nights & up to 90 days In our centrally located cozy & freshly painted condo. Unlike many rentals in the downtown area, this a a newer building with overhead sprinklers for your safety. Located on the second floor looking toward Portland's West Hills in a newer building, this sunny corner unit is near grocery, streetcar, museums, dining, PSU and the South Park Blocks with a Farmer’s Market 2 x week. Just down the street is the Performing Arts Center. The streetcar will take you in a minute to the trendy Pearl District, to Riverplace Marina, or up to Nob Hill on NW 23rd for boutique shopping. Just across the street are the newly opened Sky 8 Apartments including a sleek new coffee shop. Fine & casual dining is all over downtown Portland! One of the newer areas is the West End, between SW 10th & 13th Avenues with new dining, shopping & boutiques only 4-5 blocks away. Remember that when it’s time to relax from a day of touring or work, your comfy condo will be waiting. We rent only rent 31 nights up to 3 months. Please email us with any questions about flexibility for longer stays. Fully Equipped Kitchen: Our kitchen has all the features for full time cooking. You'll find a new dishwasher, microwave, toaster oven, coffee maker, coffee grinder, pans, dishes, and glassware including wine glasses. A convenient kitchen island is topped with mosaic tile, and has 2 bar stools. We'll even provide basic items such as salt, pepper, sugar, ketchup, mustard, & spices to get you started. Living Area: Separated from the kitchen by the island, the comfy living room has a click clack sofa, storage hassocks, a classic modern style leather recliner. There's a sleek media unit for storage, and for the flat screen TV with instant Netflix, and a dvd player. The French Doors open to the comfy queen size pillow top bed. Adjacent is a large closet system with drawers & shelves. There's also a washer/dryer in the condo, plus a tile-floor bath with a shower with glass door. Other Portland Info: Our condo is located on the edge of Portland's designated Cultural & University District. This is an urban setting with a diverse mix of older and newer buildings and condo's. The South Portland Park Blocks run through the area and are 3 blocks from the condo. Along the Park Blocks is Portland State University, several turn of the century European style churches, the Portland Art Museum, The Oregon Historical Museum, the Performing Arts Center, and the back of the home of the Portland Symphony, the Schnitzer Concert Hall. The colorful Portland streetcars are 1 and 2 blocks away from the condo, and will take you down to the Willamette River promenades, through the hip Pearl District, and up to Portland's Nob Hill area on NW 23rd Avenue. One of the owners is a licensed Oregon real estate agent--she must let you know that. A side benefit is that Sharon is exceptionally knowledgeable about the Portland area, and more than willing to answer any questions and help to orient you to our city. We hope to hear from you soon! We purchased this condo in about 2004. We love meeting people from all over the world, so it has been fun hosting it. We've lived in Portland for many years, and are amazed at the lively city it has become. We're delighted to offer tips on the city, from dining to sight seeing. We are just reactivating our Homeaway/VRBO membership in February 2018 after a hiatus off and on for a couple years, and we are excited to start wecoming new guests and sharing our love of Portland. Very convenient location with the streetcar on the corner and the university and museums only blocks away. Our condo is light filled and on the back of the building. And we were eager to own a tiny piece of downtown property, since we love downtown Portland. Across from newly completed 18 story long term apartments, a block from grocery, 2 blocks from Park Blocks. So many dining options nearby from pizza to Korean to Thai, plus food carts near PSU, fine dining downtown Portland, coffee houses, pubs. No need for a car--take Max--our light rail--from PDX baggage claim to downtown. Overlooks historic home which houses law offices and has a front garden with blossoming trees. View more about Sharon F.
The tiled floor bathroom has a glassed in shower. Your towels and bathroom accessories including shampoo, conditioner, and hair dryer are in the linen closet. 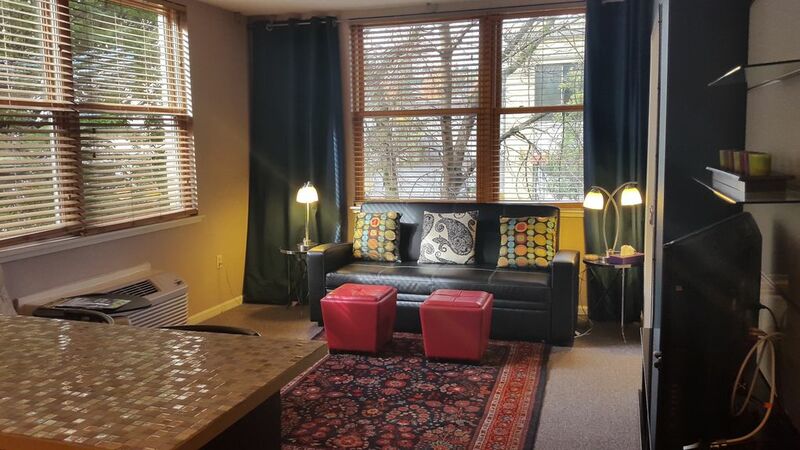 Charming Downtown PDX Extended Stay Condo for 1- 2. 31 days to 90 days. No nightly rentals. Fabulous location in Cultural District near museums, PSU, Streetcar, & light rail. Sofa. End tables with contemporary lamps. Media/Bookcase center includes 32' Flat screen, games, books. The condo is stocked with basic pantry items including salt & pepper, spices, oil, flour, salt, & more. Basic condiments are in the fridge. Service for 6-8 glasses, cereal bowls, plates, cutlery, and cooking accessories, including wine opener, knives, spatulas, hot pads, bowls, baking pans, pots, frying pans. Well equipped kitchen includes blender, coffee grinder, coffee pot, toaster oven, microwave & full size range. Custom tile topped island & granite on counters. Basic spices/oil/sugar provided. The island has two bar stools for dining there. Hello! This condo was listed on Home Away's sites most of the time from 2012 to 2017. We are reinstating it now, and look forward to greeting any new or former guests. Because it is a minimum stay of 31 days, many guests have used it as a base home for exploring the Pacific NW. Other guests have been here for corporate stays of limited duration. Still others have been here for medical treatment at OHSU, or interns have stayed during their short term assignments. Please let us know how we can help to make your stay in Portland comfortable for your needs. Thanks for considering our condo! First of all I loved my stay at this wonderful condo in the heart of downtown Portland. The space is very comfortable and well-furnished. I felt at home right away. Sharon was super friendly and acquainted me with the condo when I arrived. It's well-equipped with everything one would need to enjoy a long stay. There's a Safeway a block away for easy grocery shopping. The streetcar is just steps from the entrance, so I was able to travel just about anywhere within minutes. My month-long stay zoomed by. I highly recommend this condo to anyone who wants to experience life in the heart of downtown Portland. This is a very nice place for 1 or 2 people. It is centrally located to everything including public transportation, so the whole city is easily within reach. I would recommend staying here and when I return I will try to stay in this condo. You couldn't ask for a better host than Sharon. She was very accommodating, easy to reach, and overall a warm and wonderful woman. She made me feel very at home during my moth stay in Portland. The condo was the perfect home base for exploring all that Portland has to offer — seven minutes to Heart Coffee in the Pearl, 10 minutes to a hike with views of the city and Mt. Hood in Forest Park, 35 minutes to Multnomah Falls in the gorge. Tons of great restaurants only minutes from the unit. Really a great location. The space itself shows a few signs of being well used, but is cozy, clean, and bright, with conveniences like a washer/ dryer, a full kitchen, and a nice-size bathroom. A great corner unit with lots of windows. As with anyplace downtown, the homeless population of Portland is evident. That said, the apartment felt very safe, and I didn't have any problem using street parking in front of the building during the evenings. If you don't plan to bring a vehicle, Portland transportation is excellent, and there are several stations within a block or two of the unit. Several groceries within easy walking/ driving distance. If you're looking for a centrally located home-base, or are spending a significant amount of time downtown, this is the perfect spot. Grateful to Sharon for her hospitality. Hi Jake! Thank you for the kind review, and thank you for taking such excellent care of our condo! Your description of Portland amenities will be helpful to prospective guests, & reminds us to revisit some of these sites. We hope to see you again in Portland! The condo was in a great location-easy access to the Max, streetcar, restaurants, etc. The condo was also clean and a comfortable size for my husband and I during our one week stay. The owner was very nice and very accommodating to us during our stay. She also also answered our emails inquiries very quickly. We would stay here again if we went back to Portland. This lovely condo is well located, comfortable, clean, and perfect for a city getaway. For the 4 nights we spent there, we really felt like we lived in Portland. There is a nice open kitchen/living area with everything we needed to cook a few meals (a very silly thing to do since there is so much good food to be had in Portland!). The bathroom is clean and good-sized, The bedroom is cozy, but really, what more do you need than a comfy bed, a closet, and a few shelves for your belongings? This place has all that - plus a nice window too. Now, this condo is in a city, and with that comes some amount of street noise, so bring earplugs if you are really sensitive to that (we didn't need them and slept quite well). This place even has a washer/dryer, which was very convenient to have and really made us feel like we were at home. There is a Safeway just down the street, the art museum just past that, and between walking and the fantastic public transportation system you can easily get anywhere in Portland from this home-away-from-home. We like to walk, and were able to easily walk to the Pearl District, and the waterfront, shops, and restaurants (or should I say, food carts?!). Sharon was kind and helpful every step of the way, and even met us and showed us around when we arrived. Oh, did I mention they offer convenient parking too, at a very reasonable rate? Really, there is nothing not to like about this place, it is fantastic and we would stay here again if we get a chance, and will definitely recommend it to friends. We had a wonderful time here exploring Portland for the first time. We are so happy that you enjoyed your Portland visit! Maybe you'll put Portland on your annual vacation list! More and more guests report enjoying Portland's nearly countless food carts. Maybe your favorite cart will grow into a restaurant by your next visit--that seems to be the pattern! Thanks for taking good care of our little condo! The condo was just as described, and perfect for our needs. Very convenient grocery shopping and sights. We spent days exploring the downtown on foot, took in the rose garden, found a movie theater nearby when it was raining too hard to play outside, and enjoyed lots of good food. Sharon accommodated our arrival and departure times, for which we were very grateful. We will definitely recommend this to friends and family, and hope to return. You’ll love Portland with its lively downtown, rivers, hills, and proximity to the beach and the mountain--only 90 minutes to each! Known for its breweries, fine & innovative dining, nearby wineries, & live theatre, Portland offers something for all. Rent bikes, go hiking, wander along the river walkway--you won’t want to leave! You don’t even need to rent a car. Grab MAX at the airport (light rail) into city center, where you’ll ride free on streetcars and lightrail. Visit trendy Pearl District restaurants, watch boats at Riverplace, or scoot up to Knob Hill for boutique shopping--all on the streetcar! This is a furnished long term rental with a minimum stay of 31 days.For stays longer than 31 days, the rate shall be calculated on a per night rate of $65.